The Sole E35 Elliptical Trainer is your best mid-market choice to fill the cardio corner of your home gym. For just a little more than the cost of a low end elliptical, the E35 gives you many of the features of much more expensive elliptical trainers. This near club quality elliptical makes a truly great anchor piece for your home fitness equipment collection. Read many more details below. Building on the outstanding reputation they developed for the quality, durability and value of their treadmill line, Sole entered the elliptical market with a head start. And even though Sole engineers had over 40 years of experience designing high-end exercise machines, they made an exhaustive study of every high quality elliptical on the market to see how they could be improved. And to make sure they got it right, they teamed up with Richard DeKok, P.T., M.T.C., a leading physical therapist and sports medicine expert at the St. Bernards Industrial Rehabilitation Center. The Sole E25 elliptical trainer sports adjustable, articulating foot pedals. This led to many innovative features, such as the Sole’s unique two degree inward foot pedal slope, a feature intelligently designed to keep your body in neutral alignment and thereby reduce sore backs, knees, ankles and hips during elliptical workouts. For increased comfort, the foot pedals are extra large and their angle is adjustable. Do you have high arches or flat feet? No problem. While this can often lead to numb toes or knee pain, with the E35 you can reduce or eliminate these potential stresses by simply adjusting the pedals to the right angle for your body shape and gait. 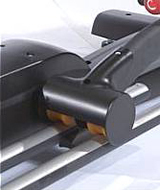 Many elliptical manufacturers handle this by simply providing articulating footpads. Like most high quality ellipticals, the Sole E35 does have these articulating footpads. But Sole goes a step further by making the footpads adjustable. If you experience numb toes, adjust the footpad angle higher. If you feel pain in your knees, adjust the angle lower. You can also alter the angle to adjust your workout: a lower angle works your hamstrings more, while a higher angle focuses the workout more on your quads. The Sole E35 packs a lot of features, many that you might expect only from higher-end ellipitcals. The full-featured electronic console is easy to use and includes a blue back-lit LCD display, a water bottle holder, a built-in cooling fan, and an MP3 player connection with built in speakers. There are 8 workout programs (7 pre-defined and 1 user defined) to provide a variety of fitness challenges. The stationary handle bars have built-in pulse sensors to monitor your heart rate. But this Sole elliptical also includes a telemetry belt and a wireless heart rate monitor for hands-free heart rate monitoring — another feature you wouldn’t expect in this price range! The upper body handle-bars provide a total body workout. These handlebars include controls for resistance and incline, so you don’t have to break your stride and reach for the console to adjust your workout. The Sole E35 offers 20 levels of resistance and an adjustable ramp angle incline from 15 to 40 degrees, giving you great workout diversity and allowing you to target any major lower-body muscle group at the touch of a button. The whisper quiet drive system provides fluid, natural elliptical motion in both forward and reverse. Four (real) wheels ride on four heavy duty rails to reduce side-to-side foot pedal motion and to provide a smoother, more stable feel. You don’t usually see this on ellipticals in this price range. 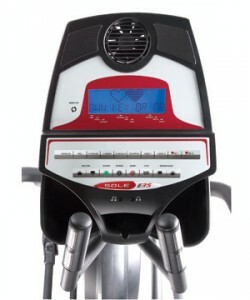 Sole has a long history of building durable, high quality fitness machines. Hilton and Omni Hotels chose Sole as the exclusive provider of in-room exercise machines. If they have proven themselves in rigorous, hi-volume hotel use, they will stand up well for your home fitness equipment needs. Sole backs up the E35 Elliptical with one of the best warranties in the industry. They provide an in-home warranty that covers the parts and electronics for 5 years and the frame for life! The limitation is only 2 years coverage for labor. This compares to a laughable 90-day warranty provided by many manufacturers such as ProForm, Reebok, Image, and Weslo. Unlike those machines, the Sole E35 will stand up well to serious use. Take a look at what others are saying about the Sole E35 Elliptical Trainer. Amazon.com customer reviews give the Sole E35 an average customer rating of 5 stars — that’s the best rating available! A popular consumer magazine (we’re not allowed to mention) gave the Sole E35 Eliptical a “Best Buy” rating for value and quality. Numerous other online and offline sources have also put the the E35 in the Best Buy category. The Treadmill Doctor says Sole Fitness has decided to be the one company this year (2009) to try to give consumers a real value for their money. 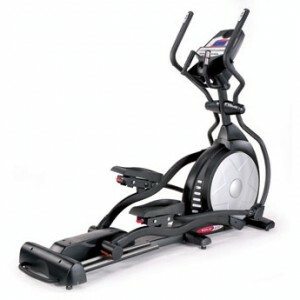 Compared to many ellipticals that have a 14-16 inch stride, the Sole E35 has a 20 inch stride. For most people, this is an upside because the longer stride length creates a smoother, more fluid motion. Your foot stays on the foot pad throughout the stride, reducing the impact on your ankles and knees. But if you are under 5’4″, you might consider a smaller stride. In this case, you should hit a local sporting goods or fitness store that carries Sole and test the feel of the 20″ inch stride on a floor model before you buy one. Regarding the console, the fan is not super powefull and the LCD and speakers could be slightly better quality. But they are pretty good considering this is home fitness equipment and they should fine be for most everyone. While the Sole E35 lists for $2,299, you can get it from Sole or many other sources for $1,299.99 with free shipping included. But note that the standard delivery is to the curb, so you’ll likely want to either find some helpful (and strong) friends or you’ll want to pay the optional inside delivery charge. To sum it up, Sole says it best: the Sole E35 Elliptical Trainer is “innovative equipment designed for fitness-conscious people.” It’s a fantastic value and it should serve you very well. Do you have a Sole? Leave a comment below and let us know what YOU think!